Discovering the grand and often bejeweled Asian elephants is a favorite highlight during a trip of a lifetime to India! Suzy Nelson traveled with her daughter, Sarah Tej, from Los Angeles to India in December 2012. 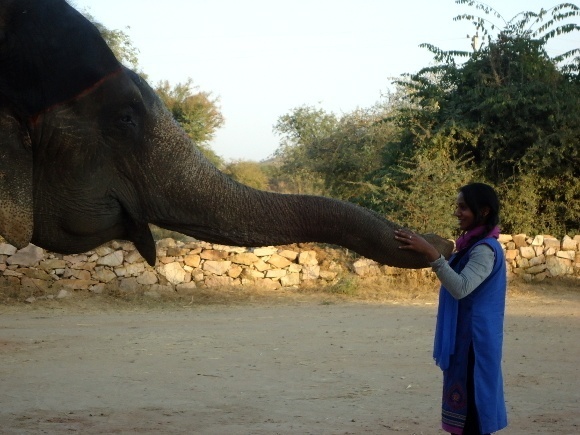 Suzy shares with us her unique elephant experience in the outskirts of the pink city of Jaipur. Our trip to India was full of luxury. We felt very well taken care of most of the time. Both my daughter and I felt that even before needing or wanting something became a conscious thought, it was seen to and taken care of. Hotel people and restaurant people worked hard to make sure we didn’t want for anything. This was especially seen by us when we went to our scheduled Dera Amer dinner. After a busy day of sightseeing it felt like pure decadence to ride on the back of beautiful Lucky the elephant. As she plodded through the jungle we enjoyed the beautiful sunset at the foothills of the Aravalli Range and sipped glasses of wine. Our mahout (elephant rider) stopped at one point and asked Sarah Tej if she would like to get in his seat. She slipped into the seat and he helped her with commands. It definitely looks easier than it actually is! We were very aware that even though this felt like a dream, with the gorgeous scenery etc. this was in reality a once in a lifetime experience and we appreciated every moment! The ride was definitely long enough and when it was time to come back down to earth, we were hungry! We were seated in a cozy area outside and although it was a little chilly by this time, we were kept as warm as toast by the wonderful man who kept shoveling what looked like goat pellets into a bonfire. As soon as the fire would die down, there he would be again — silently stoking the fire and keeping us both perfectly comfortable. One by one we were brought trays of some of the most magnificent cocktail snacks we have ever tasted. The sky was dark and full of stars. I am sure the beauty and ambience of this place only made the food taste better! After another glass of wine, we were ready to help ourselves to the buffet dinner. Perhaps because the ride, the scenery, the little tasty snacks spoiled us—we really didn’t see how it could be topped. We both mentioned that we would have been much more satisfied with more of those delicious snacks, skipping the buffet entirely! When we finished eating, it was good to see the friendly face of our driver Kamal all ready to drive us back to our hotel. In all, a beautiful, magical experience!